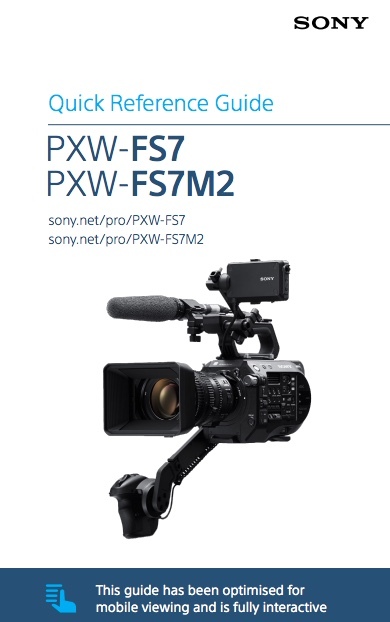 I was recently asked by Sony to write a user guide for the PXW-FS7 and FS7M2. Well it’s now complete and available for free download from Sony. The guide does not replace the manual but should act as a useful point of reference for those unfamiliar with the cameras. It should also help guide you through the use of the CineEI mode or change the various gammas settings in custom mode to suit different types of scene. There are two versions of the guide. One is an ePub book that can be displayed and read by may book reader programs such as iBooks and the other is an interactive PDF formatted for use on a mobile phone or tablet. Both versions of the guide can be downloaded from the resources section this page on the Sony site..